Controls: On off rocker switch. Fully variable control for ozone output. Optional shock treatment timer with 9 time settings, (10, 30, 60min, 2, 4, 8, 12, 18, 36hr). Warranty: The HVAC 560 electronics are warranted against defects in materials and workmanship for a period of six years from date of purchase. The UV tubes are warranted for 6 months. Liability is limited to parts and labor only. Shipping is the sole responsibility of the customer. It is recommended to have an HVAC installer install this product. The Installer will supply and determine the type of switch recommended for your specific type of air-handler if a switch is desired for automatic operation. Allergy Purifiers LLC is not liable for damage caused by shipping, misuse, neglect or lack of regular maintenance. Uses: The HVAC 560 is a small low cost ozone generator designed for use in a Building up to approx. 5000+ sq/ft. This unit does have a variable control for adjusting the output. The output starts at approx. 20 mg/hr and goes up to 560 mg/hr. The HVAC UV 560 comes in 2 versions, one version available as a UV Sterilizer; which is simply an air purifier, and one version with the ozone producing tube. Please call to order the air purifier version until we get the new purchase button made. This Ultraviolet UV ozone generator Produces ZERO nitrogen oxides, and the ozone output is unaffected by high humidity (two characteristics not possible with corona discharge ozone generators unless only pure oxygen is used for feed gas). For Example, with just 50% humidity, this unit will produce as much ozone as a corona discharge ozone generator rated at 1,450mghr, and as some competitors do not rate ozone output conservatively, this unit will exceed the output of many machines rated much higher; even outperforming some rated at 2,100mghr. this unit produces 720mghr for the first approx. 170 hours of use, then levels off to the rated 560mghr. In addition to ozone generation, UV ozone generators kill germs, super sterilize, and purify air with hydroxyl radicals, hydro peroxides, passive negative ions, super oxide ions, hydroxides, ozonide ions. This unit produces Hydroxyl Radicals as well as ozone. Hydroxyl Radicals are aggressive at killing germs that go through the machine, though they cannot travel throughout a building as their life expectancy is only a few seconds. It is the Ozone that travels throughout the building killing germs during shock treatments. This product can be used as an air purifier if advanced monitoring and controls are used to ensure that safe levels of ozone (determined by the EPA) are not exceeded. As advertised with agreement required, Allergy Purifiers LLC cannot recommend the use of this or any ozone generator for air purification use, unless you are willing to invest in the appropriate equipment for measurement and control of the ozone output. Note that this version is not simply a UV sterilizer, but a high output UV ozone generator. There is a big difference in the two types of UV bulbs used - often they are confused. 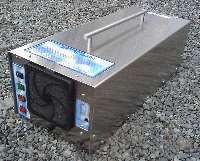 o3ozone is offering the UV sterilizer version - please call to order. The sterilizer bulbs are interchangeable with the UV ozone producing bulbs of this machine for those wanting small room occupied air purification without high levels of ozone production. The bulbs included in this machine produce high levels of ozone capable of shock treatments. With these ozone producing bulbs, on the high setting will result in high levels of ozone for shock treatment use - these high levels are for germ and mold killing treatments and should be done while no one is in the room. Lower settings are for air purifier use when not occupying the space. For portable shock treatment UV ozone generators, see the UV PRO 550, UV PRO 2800, UV PRO 4000, and the Ultra-High powered UV PRO 6800 commercial ozone generator.